The Tilsen Crew was named the "Outstanding Combat Crew" at Biggs Field. They were the first 2nd AF Crew to be recognized for outstanding work in training. The crew competed against 54 other teams. 300 (10 Jan 45), 301, 302, 303, 306, 308, 310 (1 Feb 45), 313, 315, 316, 321, 323, 324, 325, 326, 327, 329 (3 Mar 45), 330, 331, 337(DLC), 340, 341, 343, 344, 345, 350 (3 Apr 45), 352(LC), 353, 354, 355, 357 (10 Apr 45). (DLC) Flown as a Deputy Lead Crew Pilot -- (LC) Flown as a Lead Crew CoPilot without any of his assigned crewmen. For Mission dates, targets and Mission Reports, see Combat Missions. 1Lt Cyril Tilsen (P) - First mission flown as CoPilot with Combat Orientation Pilot 2Lt Howard L. Fravel. Mission 352 flown as a Lead Crew CoPilot. Other missions flown as First Pilot. Completed 29 credited missions on 10 April 45 (Mission 357). 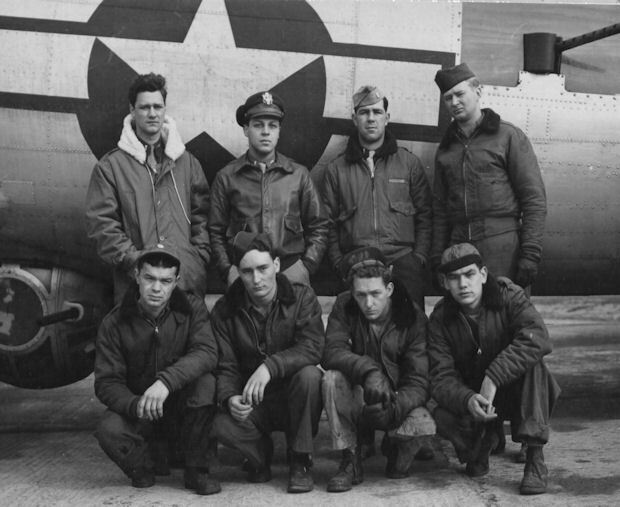 2Lt James B. McDowell (CP)(WIA) - Missions flown: 26 with 1Lt Tilsen (All Tilsen missions except 300, 302, 352); 5 with other Pilots (300, 336, 339 (As LC Tail Gunner/Observer), 347, 351). Received a minor wound on his calf on his second mission (301) on 13 January 1945 requiring his stand down on mission 302. Completed 31 credited missions on 10 April 1945 (Mission 357). 2Lt Casmir M. Bielski (N) - Missions flown: 23 with 1Lt Tilsen (All Tilsen missions except 330, 331, 337, 344, 345, 352, 353); 10 with other Pilots (312, 317, 328, 332, 336, 344, 347, 352, 353, 358). Completed 33 credited missions on 11 Apr 45 (Mission 358). 2Lt Donald T. Barger (B/N) - Missions flown: 12 with 1Lt Tilsen (As Bombardier - 300, 301, 302, 303, 306, 308, 310, 313, 321, 324, As Navigator - 330, 331); 23 with other Pilots - With 1Lt Bixby (332, 333, 336, 337, 339), With 2Lt Henning (340, 344, 346, 349, 351, 352, 353, 357, 358), With 2Lt Heitman (341, 343), With 6 other Pilots 309, 316, 323, 325, 331, 342, 350. Completed his 35 mission combat tour on 11 April 45 (Mission 358). Was the only Tilsen crewman to complete his 35 mission combat tour. T/Sgt Sherod R. Driggers, Jr. (E) - Missions flown: 28 with 1Lt Tilsen (All Tilsen missions except 352); With another Pilot (347). Completed 29 missions on 10 Apr 1945 (Mission 357). S/Sgt Arnold Mawdsley (R) - Missions flown: 28 with 1Lt Tilsen (All Tilsen missions except 352); With another Pilot (347). Also flew on a non-credited B-17 Scouter mission with LtCol Cole (358). Completed 29 credited missions on 11 Apr 145 (Mission 357). Sgt William G. Hendon (BTG) - Missions flown: 28 with 1Lt Tilsen (All Tilsen missions except 352); 2 with other Pilots (339, 347). Completed 30 missions on 10 Apr 45 (Mission 357). S/Sgt Julian R. Cassino (WG/TOG) - Missions flown: 21 with 1Lt Tilsen - 13 as Waist Gunner (300, 301, 302, 303, 306, 308, 310, 313, 315, 316, 321, 323, 340); 8 as Togglier (325, 330, 340, 343, 345, 354, 355, 357). 5 as Waist Gunner with other Pilots (309, 317, 342, 344, 353). Completed 26 credited missions on 10 Apr 1945 (Mission 357). S/Sgt Isaac H. Proctor (TG) - Missions flown: 25 with 1Lt Tilsen (All Tilsen missions except 316, 352, 355, 357). 5 with other Pilots (314, 317, 332, 347, 352). Completed 30 credited missions on 7 April 45 (Mission 354). Y-Operators - Used on two missions (329, 344). Crew flew with a Waist Gunner on fourteen missions (300, 301, 302, 303, 306, 308, 310, 313, 315, 316, 321, 323, 340, 352). 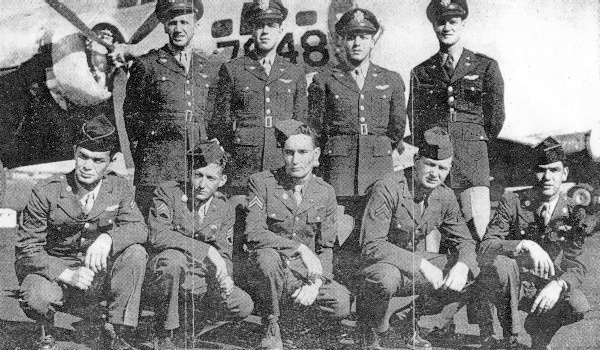 Other fifteen Lt Tilsen missions were flown with an eight man crew without a Waist Gunner. 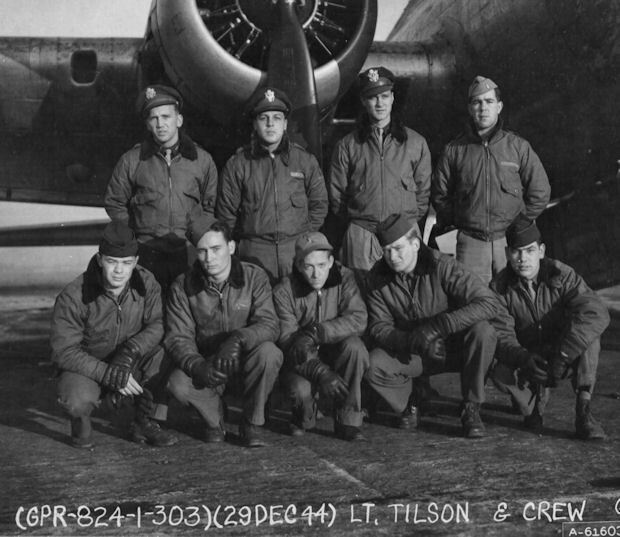 Mission 315, 15 February 1945 to Dresden, Germany in B-17G 44-3616 (No name) (358BS) VK-C.
Four of the enlisted crewmen flew their first five missions with enlisted men grades below Sergeant.. William G. Hendon (BTG) as a Private and Arnold Mawdsley (R), Julian R. Cassino (WG) and Isaac H. Proctor as Corporals. All were promoted to Sergeants following mission 306 on 22 January 1945. It was highly unusual for any 8th AF crewmen to fly a combat mission with a grade below Sergeant.